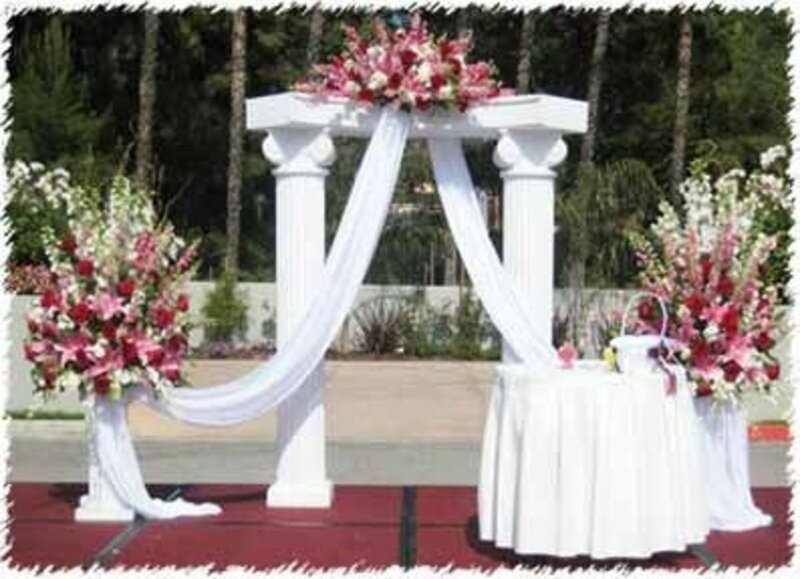 The wedding ceremony music and wedding reception music a wedding couple chooses helps set the tone for their wedding. A couple should choose wedding music they has meaning to them and they like, it's their wedding, all the music selections should not be geared just to what wedding guest's like. In discussions with wedding musicians, wedding singers, or a live band, a couple should formulate a music list to be played at their wedding. One thing that's a factor in choosing the music to be played at a couple's ceremony and wedding reception is the setting of the venue. If the ceremony is to be held at a non-religious site, a couple can choose almost any type of music as long as the music being played is in good taste. If the ceremony is in a church, chapel, synagogue, or mosque, the music selections will have to stay within the guidelines set by the clergy authority or by the religious institution. Most religious denominations think of the wedding couple's ceremony to be a form of worship service, therefore, these institutions will not allow secular (non-religious popular music) to be played at their wedding ceremony. Music that these institutions will allow are songs that make a respectful reference to God, Jesus, or the Holy Spirit. Music allowed, that is non specific to deity, are music selections devoted to religious values and ideals relating to love or marriage and topics on subjects such as faithfulness and mutual support and respect of their spouse. About 80 percent of religious institutions will not allow recorded music to be played at a wedding ceremony, they require music to be played using live musicians. Many wedding couples have their wedding music played by a church organist. Often, wedding music is played by an organist, pianist, flutist, harpist, acoustic guitar, or keyboardist or the music might have a vocalist accompaniment. Some wedding couple's will hire a stringed orchestra or bagpiper to play at their wedding ceremony or have their music played directly after the wedding and during the time the wedding couple is signing wedding papers or in a receiving line getting well wishes from their wedding guests. 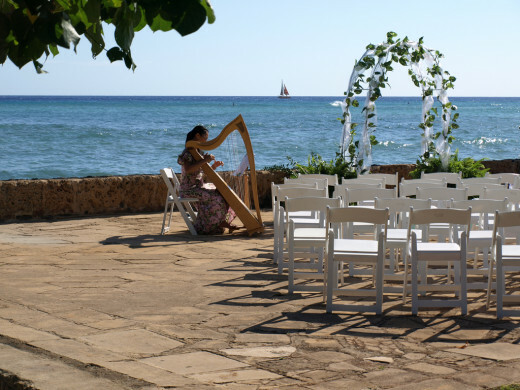 There are a number of spots for wedding musicians to play in a wedding ceremony. First there is the prelude, this is the time before the start of a wedding ceremony when wedding guests are being seated. Prelude music is often played from 20 - 45 minutes before the ceremony begins. 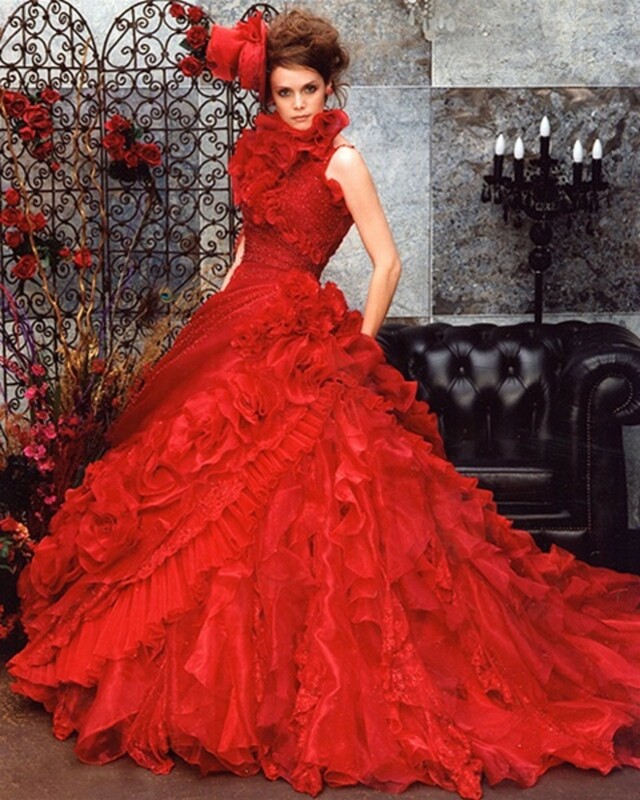 Usually music selected is beautiful serene music that moves, instills romance, that inspires the wedding guests. As the wedding ceremony begins, processional music is played, usually there is two songs played during the processional. The first processional song should be uplifting music and is played for the entrance of the bridesmaids and possibly for the flower girl and ring bearer, if they are part of the wedding. The second processional song is for when the bride walks down the aisle arm in arm with her father or with whom is giving her away. The professional music should be even a little more dramatic than the first processional. There are points in the wedding ceremony in which interlude wedding music might be played. Wedding music could be played after a reading, a sermon, the lighting of a unity candle, the pouring together of ceremony sand, the signing of the ketubah, or right before wedding vows are read aloud. The interlude music played might have a symbolic meaning, dramatize an important moment, or be romantic emotional music. After the bride and groom are pronounced husband and wife and right after the big kiss, the recessional music song should begin. This is the joyous climax of the wedding ceremony and one of life's special moments. The recession music should fire up all the wedding guests with dramatic music in which gets the wedding guests erupt in a wave of applause as the wedding couple heads up the aisle as husband and wife. The music selected should be dramatically uplifting. After the formal wedding ceremony, at some weddings, postlude music might be played while the couple is signing papers, receiving well wishes in a receiving line, or having pictures taken using a church or ceremony site background. Postlude music is often easy listening romantic background music, the length of time played is generally 20 minutes but depends on the amount of wedding guests to greet in a receiving line. As a couple begins their wedding musician search, the first thing they need to decide on the type of music and musical instruments they want to play at their wedding, and that will accommodate their music budget. The first thing you need to do is to consult with the church or wedding site coordinator with what the the musician guidelines are. In many churches or ceremony sites, any musicians chosen have to be a member of their religious institution or be on their approved list. They may have organists, vocalists, or have musicians that play flutes, violins, acoustic guitar, piano, keyboard, or other musical instruments. The church wedding coordinator might provide you with a list of their authorized musicians or might contact musicians on your behalf. Some churches will allow you to bring your own musicians to your wedding ceremony. If the church or ceremony site allow you to bring your own wedding musicians, there are a number of places you can look for the type of musician you want for your wedding. First you can get a wedding planning app that you can download to your iPhone, iPad, or Android device and download wedding planning apps onto your mobile device that will provide you with access to wedding musicians in your area. You can also find wedding musicans in wedding directories that cover your area such as www.weddingwire.com , www.gatheringguide.com , www.mywedding.com , www.theknot.com , www.eventective.com , and www.decidio.com . You can also find wedding musicians off of the web, by inputting your city and town followed by the type of musician you are searching for such as "harpist", "violinist", "flutist", "pianist" os type of musician you are searching for. You can also ask family, friends, or wedding vendors if they can recommend any particular wedding musicians. You can search for wedding musicians in the yellow pages and can find some in a website called "www.gigmasters.com . Another source for good wedding musicians is at a nearby university, community college, or music school. You can contact the headmaster or dean of a music department and ask them if they have any outstanding musicians who might be interested in playing at your wedding. You just might find an aspiring student who would love to play at your wedding. This might be a big break for a student to show off their talent and a chance to pad their resume. Regardless, anybody who plays at your wedding, you should hear them audition some of their music live, and be sure you like how they play before hiring them for your event. You might find a string quartet, pianist, violinist, flutist, harpist, and get them a lot cheaper than it would cost from a professional music group. You should interview and decide on wedding musicians as a wedding couple, be sure the music is music you both like, you should listen to various wedding musicians before deciding on whom to book. You should try to hear the music groups live in person if possible, or if it's a band, try to see them play elsewhere in person, or hear music off their website, Youtube video, CD, DVD, or MP3 player. Another option is to go to a classifieds ads website and place an ad in the Events section stating you are looking for a wedding musician to play at your wedding and will hold an audition for musicians to play for your wedding. If there are particular songs you would like to play at your wedding you could find music sheets to provide for your wedding musician. Some recommended websites for purcahing music sheets include www.pianobrothers.com , www.weddingmusiccentral.com , www.myweddingmusic.com , www.tcartermusic.com , www.classicsonline.com, and www.sheetmusicplus.com . Some couples hire a composer songwriter to write a special song for the wedding couple or for a groom's gift to his bride. Some songwriter's talk over the love story a groom wants to convey and will come up with a song about their love story. Be sure the songwriter is given enough advanced time to complete the special song. One recommended website to find a songwriter is www.weddingsongwriter.com . What Type of Music Do You Plan For Your Wedding? The typical costs to hire wedding musicians for your wedding are very varied. On the low end of the musical cost spectrum are vocalists, organists, flutists, and acoustic guitarists. These music artists often charge anywhere from $100 to $400 per person for your wedding event. In the middle range of the musical spectrum you can find pianists, harpists, violinists, and bagpipers. These musical artists often charge between $400 to $700 per person for your wedding event. On the high end of the musical spectrum are stringed quartets, brass bands, jazz bands, dance bands, big bands, and rock bands. These groups may charge anywhere from $400 to $800 per person for you wedding event. Before booking wedding musicians for your wedding reception check with your wedding venue to find out if they have any restrictions or guidelines and if there are any size limitations or if musicians have to be on an approved list. If you have a musician in mind to play at your wedding, you might ask how the musician you want can get on the venue's approved list. Before booking a wedding musician, be sure they are available on the day of your event, try to hear them play live in person if possible. Check the group out to see if they have musical snippets on their website, Youtube videos, or ask if they have a DVD, CD, or MP3 Player on past performances. Also check their background, are there any reviews on them, ask them for references, check with wedding couples or wedding vendors for which they performed in their past. Check if the musician's gave them their money's worth. Some groups sound good, but play only a couple of songs and then take a 45 minute break or don't dress up very professionally. For your wedding guests to have a good time, you want most of your music selections to be songs your wedding guests are familiar with and have heard the music before. Weddings are not a good time to play obscure music selections, guests are less likely to enjoy music they have not heard before. If you are having trouble on deciding on the type of music you want for your wedding, here are some suggestions. If you are looking for musicians for a formal atmosphere, you might hire a vocalist, a singing group, a string quartet (two violins, viola, cello), a string duo (2 violins, or a violin and cello), string trio (two violins and cello), flute trio (a flute, violin, and cello), a jazz band, an acoustic guitar, a harp, or a harp with a stringed instrument. If you want music to generate fun and exciting atmosphere consider hiring a rock band, a dance band, a live swing band, a big band, or hire ethnic bands such as Latin groups, Klezmer, Irish, mariachi, Polkska, accordionist, saxophonist, or bagpiper. If you are more looking for a sophisticated atmosphere for your event, you might hire a jazz band, a harpist, a harpist and a stringed instrument, a classical ensemble such as a string quartet, a pianist, or a pianist and violinist. If you want to create a dramatic atmosphere for your event, hire a string quartet, a pipe organ, multiple bagpipes, or hire a choir. 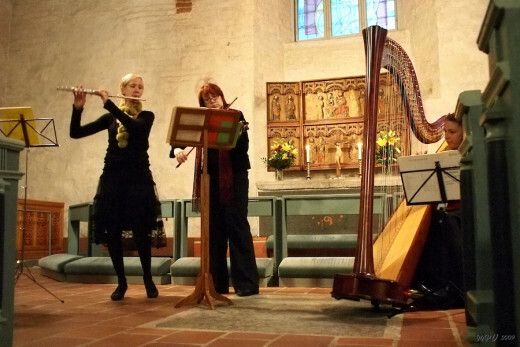 If you want an enchanting atmosphere for your event, hire a vocalist, a harpist, or a harpist and a flutist. If you want an uplifting atmosphere, hire a string quartet, a pianist, a pianist and violinist, a guitarist and a flutist, a brass band, or Caribbean drums. If you would prefer background music played at your event. Hire a string quartet, string duo, string trio, flute trio, a pianist, a pianist and violinist, or a pianist and saxophonist. Below are a sampling of musician sounds for a wedding! At your wedding you might consider hiring two music groups, hire a string quartet to play wedding songs during a pre-dinner cocktail hour and hire a band to handle the wedding reception. You might hire two musical groups, one group geared to an older crowd and another to handle a younger crowd. If you hire one entertainment group, make sure they play songs to a young crowd, a middle aged crowd, and an older crowd, make sure there is a little music played for each generation. Be mindful to play music more to the older generation earlier in the evening, they tend to leave earlier from an event, and gear to the younger generation later at an event. Try to hire music groups that are cross generations. Good reception wedding musicians will meet with the wedding couple to come up with a music list. The music selected should be geared to the musical taste of the wedding couple. A good mix of musical selections should be 40% of the music selected by the wedding couple, 30% of the music selected by wedding guests and bridal party members, and the remaining 30% is music selected and might be a specialty of the music group. A good music group plays music to keep the dance floor full and is not afraid to cut a song short and move onto another song to keep the guests dancing. When a wedding couple meets with wedding musicians, they should try to get a business card from each of the musicians in the event. 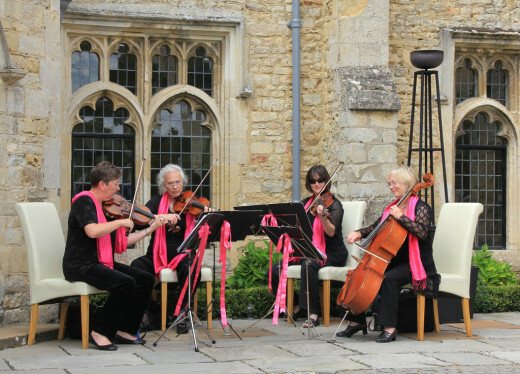 Guests are sometimes impressed with the play of musicians and may need a violinist or other musician for an occasions or musician might have left a music sheet behind, or be contacted about a change in venue due to inclement weather. At a couple's wedding, make sure the music group is not planning to advertise at your wedding. 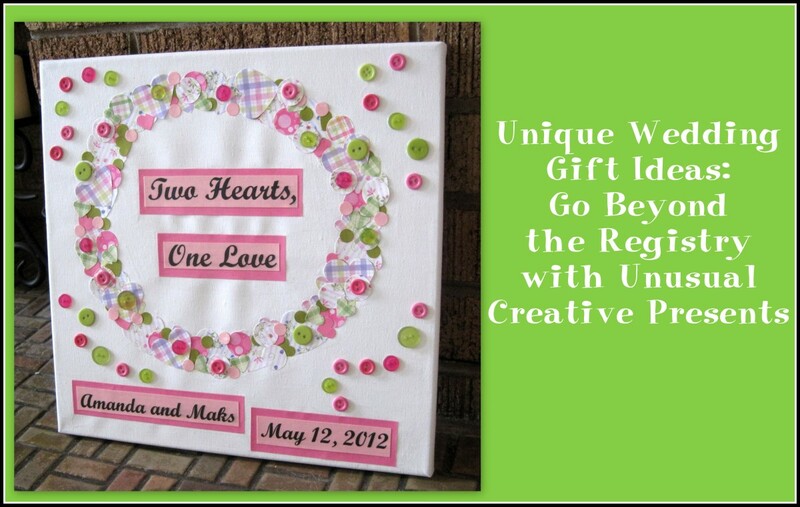 You want no banners, electric signs, or other types of visible advertising, it's not appropriate at weddings. You want no signs of advertisement in front of your wedding guests or advertisements showing up in wedding photography or wedding video. Some wedding musicians will try to promote themselves and offer you a discount if they are allowed to advertise. That's fine at a public event but not appropriate for your wedding. You don't want musicians advertising over and over again ruining the ambiance of your wedding. What you can do to help the wedding musicians advertise their services, let them advertise a little. Allow the musicians to make quick two announcements while performing, one at mid break and one again at their last break. They musicians can announce to the wedding guests to pick up their business card, sample cd, or buy their cd. Just make sure their business cards are kept in an index box at their station and not have business cards spread out on speakers or tables. Make sure anything agreed to by a music group is also stated in the contract, details should be included such as how long is the gig, how long are the breaks, how the musicians should be dressed, how is overtime handled, how they are allowed to advertise, how is travel compensation handled, are they expecting food and drink, and the contract should include a breakdown of all costs. The contract should include a cancellation clause. Are the wedding musicians insured? Do the musicians have a backup plan should a member get ill and do they have backup equipment should a piece of equipment fail? What happens if the wedding should get cancel or if the wedding musicians need to cancel? The written contract is your protection against non performance. When reviewing the contract, bring an extra set of eyes with you to review the contract before signing. Bring along your mother, sibling, maid-of-honor, wedding planner, or close friend to review the contract. Be sure to see wedding musicians perform live and are satisfied with how they perform before signing a contact. Make sure you are in contact with wedding musicians a week before the wedding and they have mastered the music pieced to be played at your wedding.